Presto’s favorite things are to watch Remy run around the backyard, to snuggle on the bed and to lavish kisses on his humans. Running agility is pretty fun too! Presto and Terry share the same birthday! 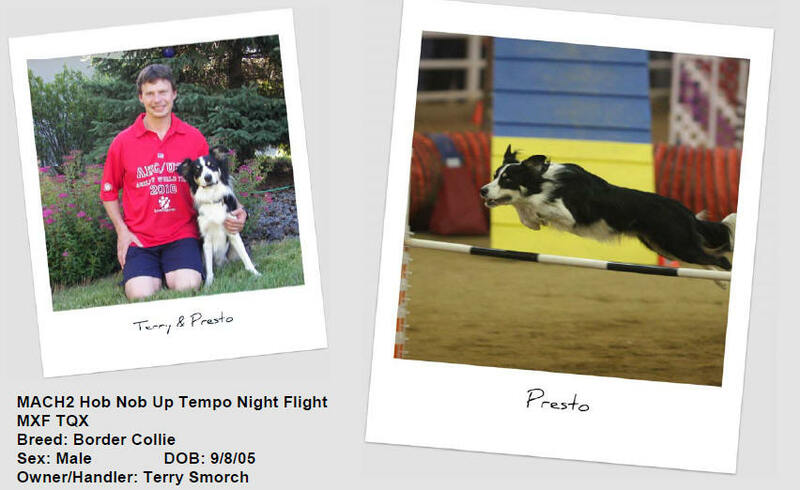 Terry Smorch has been actively involved in dog agility for seventeen years and is an AKC Agility judge. He became hooked on the sport after his wife dragged him to an agility demonstration at an AKC conformation show. Former AKC Agility World Team coach Dan Dege was running his Keeshond, Dancer, around the course. Terry started agility with Keeshonden, handling them to numerous titles in three different agility organizations. Ramsey and Terry placed second in the 20” class in the first AKC National Agility Championship in 1996. AKC Breed Champion MACH2 Pixie and Terry followed with three consecutive AKC National Agility Championships in 1997, 1998 and 1999. The looks, intelligence and speed of the Border Collie were intriguing, so in 1998 this breed joined the Smorch pack. MACH5 Remy MXF and Terry competed on the 2003 AKC/USA World Team in France, winning the Maxi Dog Team Bronze Medal. Remy, the first dog to win four consecutive AKC National Agility Championships, is also Presto’s aunt. Presto was a finalist at the first three national events he attended, earning Top Five placements at the 2009 AKC and 2009 USDAA National Championships. A career highlight so far has been winning their way onto the 2010 AKC/USA World Team. Much of Terry’s success is due to the support of his wife, Carol, who is also an AKC Agility judge and accomplished canine massage and energy work practitioner. Terry is employed by 3M Healthcare as a process development engineer, bringing new medical products to market to help prevent healthcare associated infections. He also uses his chemical engineering skills to homebrew beer.